Lake Victoria, the second largest freshwater lake in the world, partially resides within three countries in Africa: Kenya, Tanzania, and Uganda. Prior to 1954, over ninety percent of the lake fish population was comprised of several hundred species of a fish known as cichlids. In 1954, however, Nile perch were introduced to the freshwater lake due to the popularity of their consumption. Since then, the perch, which can grow to four feet long and over 200 pounds, have driven the populations of cichlids to the brink of extinction. 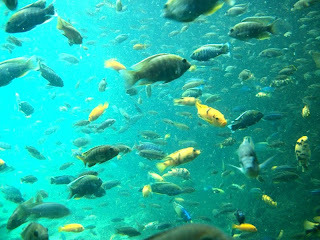 In Harambe’s Pangani Forest Exploration Trail School and Sanctuary, found deep in the wilds of Africa in Disney’s Animal Kingdom, a host of Victorian Rock Cichlids is thriving in waters free from the intrusion of the Nile perch. Ninety-nine percent of the cichlids in the world are found in Lake Victoria, but in order to preserve and expand to dwindling populations international conservation efforts have led to the selection of other sites where the cichlids could swell their numbers. The transparent habitat found along the Pangani trail is one such site, and allows researchers and guests alike to study the resurgence of this disappearing species. While the Nile perch may be a popular protein source throughout the remainder of the globe, the cichlids are a staple of the fishing communities that surround Lake Victoria. With propagation and conservation programs like the one found in Harambe the damage to local ecosystems can be repaired and replenished. Very Cool. Thanks for sharing tis information!